2) Fisheye Lens: 198 degree gives your image a round, fish bowl effect while also acts as a wide angle lens. 3) Telephoto Lens:It gets up close with 2 times optical magnification. 4) 0.63x Wide-angle + 15X Macro 2 in 1 Lens: The wide angle lens will allow you to capture larger scenes. Macro lens magnifies the tiny little things so that we can capture the picture with their crisp details. 5) CPL:It filters polarizes light, reduces reflections, enhances color and increases contrast. 6)Kaleidoscope Lens: Kaleidoscope Lens shows you an overlapping vision. The Camera Lens Kit can be used on smartphones, tablets and Laptops. Such as iPhone 7 iPhone 6 plus/6/5/5S/4/4S, iPad Air 2/1, iPad 4/3/2, iPad Mini 3/2/1, Samsung Galaxy S7/S6 Edge/S6/S5/S4/S3/A7/A5, Galaxy Note 4/3/2, Blackberry Bold Touch, Sony Xperia, Motorola Droid and many other mobile devices. Superb Quality Design: Professionally manufactured product made from aluminum alloy, to increase the durability of the product. Multifunction: Enjoy the high quality technical image effect. Create fun shots with the fisheye lens which allows the phone/Pads to take fun circular pictures, the wide-angle lens to shoot landscape or even group pictures, the macro lens to take pics of small objects like flowers, the telephoto lens for shooting distance pictures, the CPL to eliminate reflections, enhances color and increases contrast. 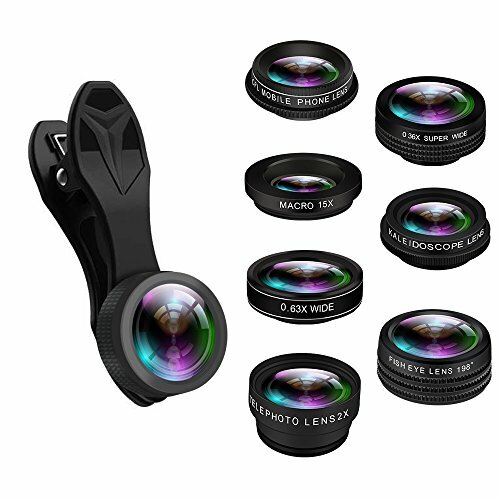 Portable: This Cellphone Lens Kit contains 7 kinds of cell phone lenses in a storage case, easy to carry. Wide Compatibility: Universal detachable clip for most smart phones and tablets, such as iPhone, Samsung Galaxy, iPad and other mobile device. It also can work on anywhere you can imagine. If you have any questions about this product by misognare, contact us by completing and submitting the form below. If you are looking for a specif part number, please include it with your message. Google Pixel XL Case with Wide Lens Kit || Moment Black Canvas Photo Case plus Wide Lens || Best google wide attachment lens with thin protective case.